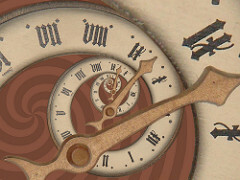 Time is a funny thing – it’s the scarcest resource we are allowed to use. There are countless books, software programs and systems that aim to help us manage and control it, but for the small business there is a complex set of variables that come in to play. I’ve begun to apply the term logistics more broadly when it comes to running a business. The term is commonly used when referring to the idea of delivering a product or set of good from one location to another, but what if you began to think about the logistical consumption of time to deliver a result from one state to another. I think that’s what small businesses must do at the highest level and the manager or owner of that business brings the highest value when they can orchestrate, not manage, time – the organization’s greatest resource. Stay with me on this because now I need to add another layer. Today it’s not enough to show up and create a to do list and call it a symphony of time. Today every business has three clocks running at all time – and the management of the flow of goods, information and other resources, energy and people and depend on observing each of these clock – although they run at different paces. Today’s business needs to live simultaneously in real time, deal time, and meal time.